WEST VILLAGE — A gluten-free lunch option is on the way for workers and residents in the West Village and Hudson Square. The "fast, healthy and fresh" Asian restaurant Vien will open on Varick Street near Downing Street by mid-September, owner Mark Sy said. Drawing inspiration from across Asia, the 220 Varick St. eatery will serve affordable hot and cold dishes, which all happen to be gluten-free. "It's basically a Southeast Asian version of the Chipotle model," said Sy, 27, who grew up in Manila and Hong Kong and spent six months traveling throughout Asia for menu inspiration. 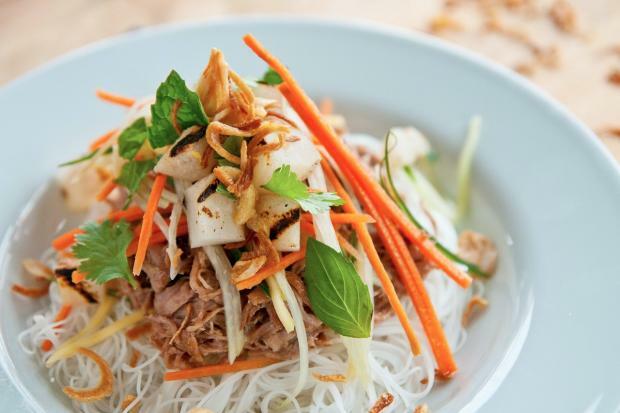 Vien customers will order by first selecting a "base" like chilled rice noodles, jasmine rice or mixed lettuce. Then, they will pick a protein like slow-cooked pork with coconut milk, grilled chicken with lemongrass, or seared tofu with turmeric and mustard seed. Next on the conveyor belt are fruits, with options including grilled Asian pear and tomato-ginger jam. Each plate is then topped with a sauce, like peanut with coconut cream or Vietnamese lime with fish sauce. Finally, diners select garnishes like crispy shallots, roasted peanuts and fresh herbs. The plates cost from $7.95 to $11.25 each. Located near IHOP, a check-cashing service and the Mexican restaurant La Camelia, Vien's space previously housed the Mediterranean restaurant Red Corner Cafe.